It's that glorious time of year when many homeowners are spending more time relaxing on their patios than in their living rooms. 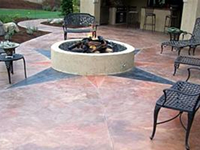 Now is also the perfect opportunity to upgrade an existing concrete patio and make it more attractive and inviting. Depending on the budget, it can be as simple as spiffing up the patio with a coat of stain or as elaborate as installing an outdoor kitchen complete with concrete countertops. See five popular patio makeovers sure to make summer outdoors more enjoyable. 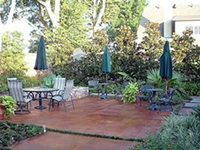 Staining is an easy, low-cost way to enhance a plain-gray concrete patio. As long as the concrete is in good condition and you prepare the surface properly, the stain will provide rich long-lasting color. See these patio surface colors and patterns. Seat walls help define outdoor rooms, highlight focal points, and add permanent seating for entertaining without taking up much room. The use of well-placed seat walls can easily add seating for 10 to 15 guests. Nearly any existing patio can be retrofit with a concrete fire pit to add warmth and ambience on cool evenings. Many shapes and designs are possible, from round to octagonal. 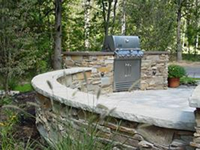 A gas grill and concrete countertops are all it takes to turn a patio into a functional outdoor kitchen. 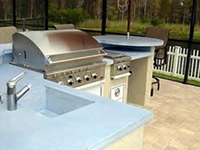 Of course, other amenities can be added for the serious outdoor cook, such as a pizza oven, a concrete sink and built-in food and beverage storage. A concrete fountain or even a modular pond can be placed on or alongside an existing patio to add the soothing sounds and hypnotic movement of cascading water. 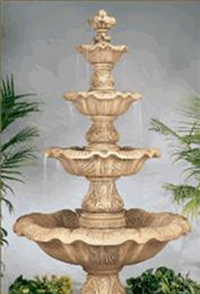 Precast concrete fountains are available in a numerous array of sizes and styles.